Over 100 players competed in the tournament from the Bahamas, Barbados, Bermuda, Cayman Islands, Guyana, Jamaica, OECS, Trinidad and Tobago and Venezuela. The OECS contingent had two seeded players in the individual event, with Sherina Slater and Diarra Venner seeded No. 1 and 2 in the Boysâ and Girlsâ Under-13 divisions respectively. After finishing 3rd in the 2003 event, Sherina Slater was the strong favourite for the title but suffered an upset to archrival Kayla Jeffrey (Guyana) in the semi-finals. Sherina lost in a close encounter 0-9, 9-7, 9-5, 3-9, 4-9 to settle for 3rd place with a 9-5, 9-1, 9-7 win over Jamaica’s Brooke Burrowes. The star of the O.E.C.S team however, was 12-year-old Diarra Venner, who brushed aside all his opponents in straight games to become the first Caribbean Junior Champion from the OECS since Enrique Riveroll (SVG) in 1986. OECS No. 1 Junior Shane Slater faced stiff challenges in the competitive Boysâ Under-17 division where he battled to reach the semi-finals of the Plate draw, losing a 9-2, 4-9, 9-5, 2-9, 3-9 marathon match to Alex Garcia of Barbados. The other Vincentian competitors suffered early defeats as they were outplayed by their opponents. The next challenge was the team event, featuring nine boys teams and seven girls teams. In the group stages, the OECS Boys and Girls teams finished 3rd in the Group B and D respectively, ahead of Bahamas (Boys) and Cayman Islands (Girls). The Boys’ team was then placed against Venezuela to determine 5th place in the Boys’ team event. With wins from SVG’s Diarra Venner (Under-13) and BVI’s Joe Chapman (Under-15), the score was 2-2 and the tiebreaker went to team captain Shane Slater in the Boys Under-17 match. All was looking well after Shane won the first game 9-4, but the determined Venezuelan rallied to a 4-9, 9-2, 9-4, 9-1 victory for Venezuela. The Boysâ team ended up in 7th place after a 4-1 loss to Trinidad and Tobago. On the distaff side, the Girlsâ team clinched a best-ever 5th position after beating the Cayman girls 3-2 for the second time in the competition. After Cayman upset Bermuda in the early play-off match, a rematch was set with OECS, but once again Vincentians Sherina Slater (Under-13) and Amber Glasgow (Under-17) along with Lucian Melissa Rivers (Under-19 #2) clinched the win for OECS. 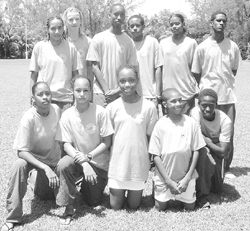 The team then finished in 6th place overall, behind Barbados, Jamaica, Guyana, Trinidad and Tobago and Bermuda. The next edition of the championships is set for July 2005 in Trinidad and Tobago.